Llanbedrog accommodation - high quality bed and breakfast in Llanbedrog, guest house Llanbedrog, Llanbedrog hotel, Llanbedrog bed and breakfast, Llanbedrog b&b, pet friendly accommodation in Llanbedrog. Abersoch accommodation - high quality bed and breakfast in Abersoch, guest house abersoch, abersoch hotel, abersoch bed and breakfast, abersoch b&b, pet friendly accommodation in Abersoch. Pwllheli accommodation - high quality bed and breakfast in Pwllheli, guest house Pwllheli, Pwllheli hotel, Llanbedrog bed and breakfast, Pwllheli b&b, pet friendly accommodation in Pwllheli. If you are looking for "Llanbedrog accommodation - high quality bed and breakfast in Llanbedrog, guest house Llanbedrog, Llanbedrog hotel, Llanbedrog bed and breakfast, Llanbedrog b&b, pet friendly accommodation in Llanbedrog", then this is the page for you. If accessing a web site from the table below - each link will be opened in a new window for you. Some of the establishments listed are pet friendly, so please visit their web site for details. We offer exceptional Country House Bed & Breakfast (B&B) accommodation, in a delightful and unique setting, with every attention paid to your comfort and enjoyment for your vacation or holiday. Choose between our TWO rooms The Love Parry Suite (King Size Four Poster en-suite), which can also be converted into a family room with two extra single beds or our Garden Room (Twin en-suite). We are the only pet friendly establishment in the area and we have ample free parking for your cars and boats, as well as free Wi-fi and accept major cards. One of the few B&B's locally that has free Wi-Fi, free ample off street parking, pet friendly, family friendly, cards accepted, open all year - flexible - why choose anywhere else! Craig Y Glyn is focused on providing high-quality service and customer satisfaction - we will do everything we can to meet your expectations. With a variety of accommodation offerings to choose from, we're sure you'll be happy staying with us. Look around our website and if you have any comments or questions, please feel free to contact us. Tremfan Hall is a majestic country house, overlooking Llanbedrog Head, Cardigan Bay and the mountains of Snowdonia. Luxury en-suite accommodation is offered in the oak-panelled former house of John Gwenogfryn Evans, a minister and editor of Welsh books and letters and founder member of the National Library of Wales at Aberystwyth. We offer 4 double rooms all en-suite, 1 double family room en-suite and 1 twin bedded room. The house is furnished to a very high standard in keeping with its history. Comfortable double and twin rooms available most suited for couples and small families. Includes breakfast with parking facilities. Rooms come with free wifi, freeview and tea & coffee. Tracey and Alan welcome you to Penmaen House, known locally as Castell Penmaen. The house is situated in an elevated position overlooking Cardigan Bay and Pwllheli Marina. The well manicured gardens extend to 2 acres and are available to guests for walks or picnics. The town of Pwllheli is 5 minutes walk and the very popular Abersoch is 6 or 7 minutes drive. Llanbedrog one of the most beautiful spots in the area is en route to Abersoch. All our bedrooms have undergone major refurbishment and offer colour TV and hospitality trays. Most of our rooms have sea views, we offer 8 bedrooms. Plus we offer THE place for breakfast in our cafe if you are in the area, details on our web site. A Robinson's Brewery pub has a fantastic outside drinking and dining area plus superb accommodation (three rooms for Bed and Breakfast). 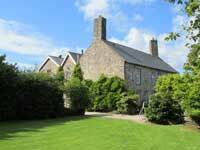 Set in over 3 acres of grounds in a sheltered, wooded area of the lovely Llyn Peninsula. Home to the Rectors of Boduan since the early 18th Century, The Old Rectory has been carefully restored over the years and now offers the opportunity for guests to enjoy the peaceful atmosphere of a much loved home. We have details of over 90 properties and caravan parks throughout North Wales and Snowdonia, from bed and breakfast accommodation on the isle of Anglesey in the north to self catering farmhouses and cottages near Bala and Machynlleth in the south. And from seaside holidays in Abersoch, Porthmadog and Caernarfon and all along the Llyn peninsula, to inland accommodation in Betws Y Coed and LLanrwst near Snowdon. So whether you want a holiday at the seaside or would prefer to be closer to the mountains and lakes, or the tranquility of the countryside or the hustle and bustle of a town, North Wales and Snowdonia Holidays will show you the ideal place to stay. Relax amidst spectacular scenery in a super central Snowdonia location. Beautifully appointed, private barn and stable suite accommodation with Jacuzzi bath& shower. All 5 star facilities inc. soft toweling bathrobes. Suites have large patio windows & a garden/patio area overlooking either countryside or mountain range. Snacks preparation area with beverage trays , fridge, microwave & toaster. Your choice of breakfast (menu on full website). Warm informal atmosphere and welcome. Local area has an abundance of attractions and walks (e.g. Portmeirion 6 mls) see attractions link of full website. Feed the ducks on the millpond & meet our friendly sheep and Shetland ponies. Farmhouse Award, Welcome Host Gold. Open all year.